Make a sacrifice to this dark, terrifying magazine... before it rises and walks the Earth! Now is your time to pledge your fealty to Nightmare Magazine — before it is fully manifested, and able to inhabit your brain with its raw terrors. 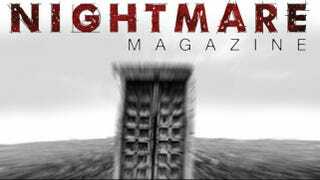 The horrifying brainchild of John Joseph Adams, who's brought you Lightspeed Magazine and countless anthologies, Nightmare is poised to overwhelm you with the forces of darkness. Can you afford to take a chance on not pledging to this magazine, given the horrors it will have at its command? Not familiar with Kickstarter? Essentially, you pledge any amount to support a project, and then choose one of the rewards in the right column. You only get charged if the project reaches its fundraising goal. Here's the FAQ page. In Nightmare's pages, you will find all kinds of horror fiction, from zombie stories and haunted house tales, to visceral psychological horror. No subject is off-limits, and we will be encouraging our writers to take chances with their fiction and push the envelope. Edited by bestselling anthologist John Joseph Adams, every month Nightmare will bring you a mix of originals and reprints, and featuring a variety of authors-from the bestsellers and award-winners you already know to the best new voices you haven't heard of yet. When you read Nightmare, it is our hope that you'll see where horror comes from, where it is now, and where it's going. Nightmare will also include nonfiction, fiction podcasts, and Q&As with our authors that go behind-the-scenes of their stories. Our planned publication schedule each month will include two pieces of original fiction and two fiction reprints, along with a feature interview and an artist gallery showcasing our cover artist. We will publish ebook issues on the first of every month, which will be available for sale in ePub format via our website and also available in other formats such as Kindle and Nook. We will also offer subscriptions to our ebook edition in a variety of formats. Each issue's contents will be serialized on our website throughout the month, with new features publishing on the first four Wednesdays of every month. Sarah Langan is the author of the novels The Keeper and The Missing, and her most recent novel, Audrey's Door, won the 2009 Stoker for best novel. Her short fiction has appeared in the magazines Cemetery Dance, Phantom, and Chiaroscuro, and in the anthologies Brave New Worlds, Darkness on the Edge, and Unspeakable Horror. She is currently working on a post-apocalyptic young adult series called Kids and two adult novels: Empty Houses, which was inspired by The Twilight Zone, and My Father's Ghost, which was inspired by Hamlet. Her work has been translated into ten languages and optioned by the Weinstein Company for film. It has also garnered three Bram Stoker Awards, an American Library Association Award, two Dark Scribe Awards, a New York Times Book Review editor's pick, and a Publishers Weekly favorite book of the year selection. Jonathan Maberry is a NY Times bestselling author, multiple Bram Stoker Award winner, and Marvel Comics writer. He's the author of many novels including Assassin's Code, Flesh & Bone Dead of Night, Patient Zero and Rot & Ruin; and the editor of V-Wars: A Chronicle of the Vampire Wars. His nonfiction books on topics ranging from martial arts to zombie pop-culture. Since 1978 he has sold more than 1200 magazine feature articles, 3000 columns, two plays, greeting cards, song lyrics, poetry, and textbooks. Jonathan continues to teach the celebrated Experimental Writing for Teens class, which he created. He founded the Writers Coffeehouse and co-founded The Liars Club; and is a frequent speaker at schools and libraries, as well as a keynote speaker and guest of honor at major writers and genre conferences. We believe that the horror/fantasy community's diversity is its greatest strength, and we wish that viewpoint to be reflected in our story content and our submission queues. Accordingly, we will welcome and encourage submissions from writers both experienced and new, as well as from writers of every race, religion, nationality, gender, and sexual orientation.